Welcome to another wonderful Play Date Cafe Color Challenge. This week Julie picked a wonderful Color Story - Pink, Black, Grey and White, see the color story at the bottom of my post. I just *love* this combination! As you can see from the above close up, I took a bit of creative liberties and used Silver as my "grey". I got a little carried away with this weeks colors, and created a cute little ensemble that would be perfect for a last minute Mother's Day Gift. Heck it would be a perfect gift for any occasion! I created the cute little tote using Adela's Haute Tote Template, the bag uses Pink/White DSP with Black Trim. Note, when using templates and printing directly onto Black card stock, I found it much easier to print the pieces that I knew were going to be cut from Black card stock on copy paper, then cut and traced them using a White Gel pen onto the Black card stock. So much easier to see the lines on Black doing it this way. The cute Haute Tote can be used to give a nice little gift, it will also hold a set of A2 cards wonderfully. That's not all, there's even a template for an inside pocket, that's just the right size for a gift card! (As seen above). I added some Filigree Brads and Rhinestones as the trim to hold the purse handles. I did a little paper piecing along the Black trim panels. I decorated the tag to coordinate with the tote. I created the matching card using the Fifth Avenue Floral image and Paper Tole Technique. 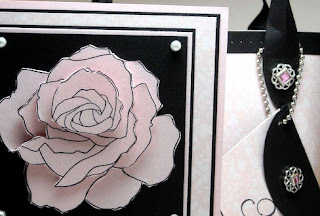 This technique adds wonderful dimension to the beautiful rose. The sentiments are from Our Daily Bread Designs Mom set. Thanks so much for stopping by, we'd love for you to play along with this weeks challenge at The Play Date Cafe, you can find all the details here on how to enter. Gorgeous tote Lisa. Love the colours. Wow Lisa! I couldn't believe you made that neat bag, too! 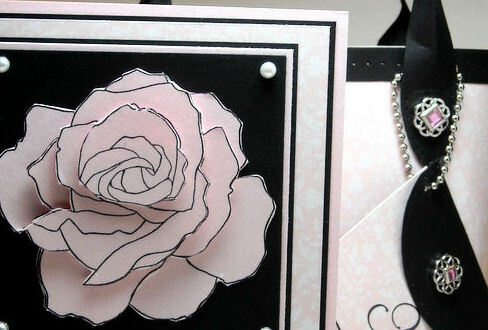 First of all, the choice of the SU rose was wonderful.....I LOVE, LOVE the color combo this week and how you used it! This is one CrAzY wonderful gift set, Lisa...the use of the colors with this are perfect and if I'm being honest, I contemplated using silver myself : ) I think Sarah did as well! Awesome ensemble!!! This is amazing-love that little purse! WOW! GORGEOUS stylish ensamble! Love the coordinating card and bag. That bag looks like it is made out of real leather. Wow! These are absolutely beautiful! Amazing! Move over Coach, new brand in town, bags by Lisa S.!! Totally awesome!!!! What a lovely tote and the matching card is gorgeous, Lisa! Such a fab gift ensemble!! Gorgeous ensemble Lisa! That big blossom looks fabulous! Gorgeous gift ensemble Lisa! Love how you used the square rhinestone brads in the silver filigree flowers for the purse 'hardware'. Here's a tip for marking out a template on black cardstock - a regular #2 pencil works great. You can see it and it won't smear. What a beautiful project! It is so pretty in the colors for your challenge- the accents with the sparkly brads-gorgeous and I LOVE, LOVE the floral card you created! WOW!!! Oh My word, this set is gorgeous and i LOVE,LOVE the tote bag. Definatelt going to give that a try! LOVE IT! Wow Lisa, this is absolutely GORGEOUS!!!! Love everything about it, what a great gift set! How did I miss this post?!! Love these ideas!! You did a beautiful job on yor tote and flowers!! I had to read and reread to believe you made them!! The tote looks real! oh. my. goodness that rocks!!!! Such a pretty creation! love the little tote too.. This is gorgeous, I LOOOVE that tote. I actually thought it was a handbag you bought and made card to gift it and wanted to see if you listed where you purchased it and saw it was part of your craft. It is fabulous!! And love the colors.